Images: The complete poster exhibition can be seen online at: http://www.ashevillecourtyard.com/posters.pdf Other high resolution images are available on request. Asheville, NC September 18th, 2013…A groundbreaking exhibition, In Search of Lost Causes examines three discrete but interrelated aspects of Iranian art of the 1960s through 1980. Organized by the Flood Gallery, Courtyard Gallery and UNCA, In Search of Lost Causes presents over 125 never before exhibited works— revolutionary posters, film screenings and black-and-white photographs—and is on view at UNCA Library and the Courtyard and Flood Galleries at 109 Roberts St, RAD, Asheville from Oct 17th through November 29th, 2013. After opening in Asheville, NC, the exhibit is scheduled to travel in various parts of the US and Europe. In Search of Lost Causes: Images of the Iranian Revolution: Paradox, Propaganda, and Persuasion introduces American audiences to modern Iranian art while shedding light on the many ways visual culture both reflected and affected the 1960s and 1970s, two decades that saw dramatic changes, including the politicization of Islam and the 1979 Iranian Revolution. The exhibition features a selection of revolutionary posters by professional and amateur artists who combined calligraphy, graphics, and rhetoric to convey abstract ideologies. Also exhibited are striking black-and-white photographs from the 1970s by anonymous Iranian photographers, and a series of modern Iranian films. These posters, photographs, and films encourage re-examining the notion of modernism in a non-Western culture. “The significance of the Courtyard Gallery Collection of the Flood Fine Arts Center cannot be exaggerated––not just because of the actual collection but also because of the serendipitous manner in which history had decided to safeguard these magnificent traces of deeply traumatic episodes in a people’s struggle for freedom and justice. For these reasons alone, it simply must open in Asheville. 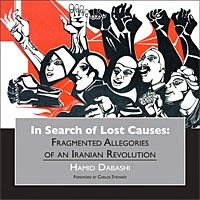 Dr. Dabashi has written a book about this collected titled “In Search of Lost Causes: Fragmented Allegories of an Iranian Revolution, and will be signing copies of the book during events at UNCA and the galleries. 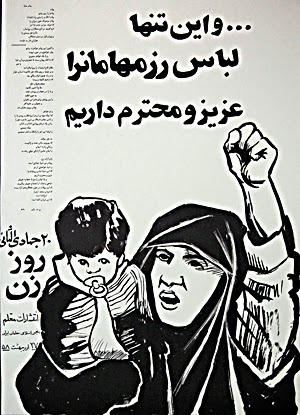 The Iranian revolutionary posters shown with In Search of Lost Causes offer a fascinating glimpse into Iran’s modern visual culture. 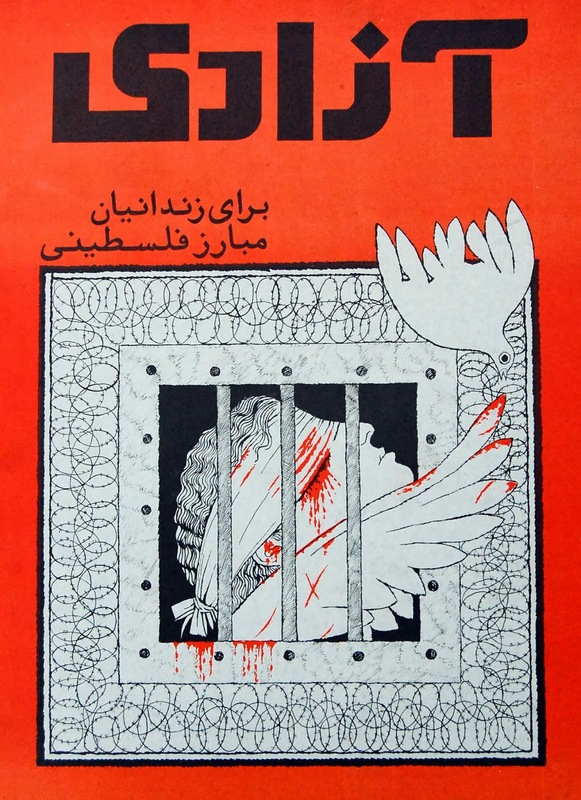 Composed with bold forms, intense colors, and calligraphy, these posters pervaded Tehran during the uprising. Created between 1978 and 1980, they were used as props in mass choreographed street demonstrations, and covered buildings throughout Iran’s cities, often defacing public monuments built by Shah Pahlavi’s regime as symbols of its authority and grandeur. The posters were replaced almost as fast as the government tore them down. Art, reportage, poetry, and politics all became entangled in a distinct form of visual culture. Many posters allude to battle scenes from the Koran or classical Persian poems; others proclaim solidarity with Palestine and the Kurds. Vivid red backgrounds refer to bloodshed and the red tulip, an icon of classical Persian literature. Anonymous artists combined various techniques and symbols, from newspaper collages to silkscreened portraits juxtaposed against bright, abstract backgrounds, reminiscent of Andy Warhol whose portraits of the Shah and the Queen hung in the Tehran Museum of Contemporary Art. “Iranian modernism, like many of the culturally specific modernisms that emerged around the globe, was not synonymous with the one constructed in the West,” says Jolene Mechanic, director of the Flood Fine Arts Center. “Both nationalist and internationalist, it looked inward as well as outward. In art, its languages included realism and abstraction, but formal issues were not its primary problems: the fundamental questions addressed by Iranian modernism centered on the notion of identity.” In Search of Lost Causes: Images of the Iranian Revolution: Paradox, Propaganda, and Persuasion is co-curated by Jolene Mechanic and Carlos Steward in consultation with Dr. Hamid Dabashi. The second section of the exhibition features photographs by Iranian photographers that provide critical information about Iran in 1970s. Taken between 1978 and 1980, these photos provide startling and vivid views of Tehran and its citizens caught up in the throes of a whirlwind. Some have become iconic images. The third section, the films, provide a look at Iran’s modern Cinema that was blossoming during and after the revolution. This project is important to both our local community and the community at large, as our society becomes increasingly influenced by media and corporations with agendas of keeping us misinformed for their own profit motives. We cannot effectively participate in a democracy if we don’t know the truth and conditions of the other cultures that we have become accustomed to manipulating into what we believe is best for them. Through exhibition it is anticipated that audiences will begin to question their assumptions about Iran­, the negative influences of propaganda, and the power of persuasion by special interest groups. 6–7:30 p.m. Reception for Dr. Hamid Dabashi, Columbia University at the Ramsey Library Glasshouse. 8:30 p.m. Screening of This is Not a Film in the Walt Whitman Room. This is not a Film documents a day in the life of prisoner Jafar Panahi, banned for 20 years from filmmaking in Iran. The film was smuggled out of Iran in a USB stick hidden in a cake. 6–8 p.m. Reception–poster art lecture and book signings by Dr. Dabashi. 8 p.m. Screening of Chicken with Plums at the Courtyard Gallery. Directed by Marjane Satrapi and Vincent Paronnaud, this film adaptation of the graphic novel tells the story of Nasser Ali, a renowned musician who losess all taste for life after his beloved violin is broken. 8 p.m. Screening of Persepolis at the Courtyard Gallery. Directed by Marjane Satrapi and Vincent Paronnaud, Persepolis is a poignant coming-of-age story about a precocious and outspoken young Iranian girl that begins during the Islamic Revolution. Posters will be on exhibit at Ramsey Libraby at UNC Asheville from October 1 through October 30, 2013. Posters will be on exhibit at the Flood Fine Arts Center from October 17 through November 29, 2013.